Yeyo Arts Collective: yeyoARTS Members' support local Artist Gary Hudson! yeyoARTS Members' support local Artist Gary Hudson! 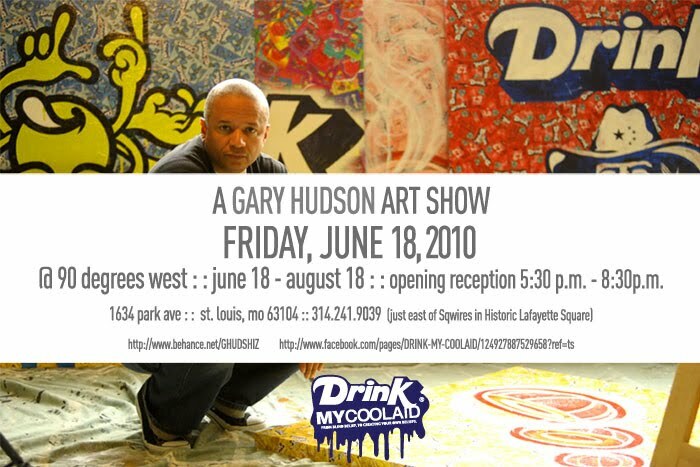 Please join us at the opening reception of the Drink Mycoolaid Art Exhibit and my first stab into art event planning. The fun begins 5:30pm, June 18,2010 at the 90 Degree West, 1634 Park . Following is a brief explanation about the exhibit. THE DRINK MY COOLAID SERIES: A visual exercise touching on the process of how our mindsets are forged -- from initial beliefs thrust upon us in our youth (and all too often adopted), through the creation of our own. Open the hyper links below to see the artwork and the attachments above to see the invitations. Let me know what you think and if you can come through. Please pass it on. Thanks and I will see you June 18th.